Long before she was a Fairy Godmother in Cinderella, actress Helena Bonham Carter was a scheming drug addict, or at least she played one on TV. Check out the awesome clip below from a 1987 episode of Miami Vice, in which Carter plays a doctor with a prescription for addiction. One of Carter’s earliest acting gigs was a two-episode Miami Vice stint during the hit series’ third season. The clip above is from the episode “Theresa,” named after her character Dr. Theresa Lyons, the woman responsible for destroying evidence in an investigation. (Spoiler?) She also happens to be a junkie who’s getting her drugs from Brad Dourif, whom I wish was also in this clip at some point. Weren’t the 1980s fun? I mean, Carter was 21 years old at the time, and she was already playing a doctor with a drug problem. It usually takes years or at least a childhood acting career to bring that kind of downward spiral about so quickly. In any case, her youthful appearance makes one appreciate just how well she’s aged over the years. Carter’s acting is pretty subdued in this scene and barely hints at the wide-ranging career to follow. 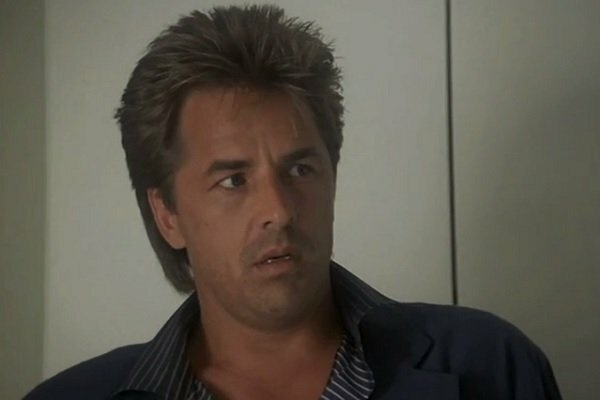 But Don Johnson was certainly on his A-game here, going from simmering to hollering in just one reaction to a nurse’s ignorance. And just look at the sheer disdain on his face. By the by, there is a startling lack of heart-pumping 1980s synths and electronic drums in this clip, but that’s understandable, since this is a Miami Vice scene built more around drama over flashy action. But dammit, it just made me want to hear Jon Hammer’s theme anyway. Though if we’re being honest, there are few things that don’t make me want to listen to the Miami Vice theme. NBC shared the clip to promote the Classic TV area of their website, which features hits old and new, like Charles in Charge, The Incredible Hulk and Knight Rider, among many others that are actually newer. They also recently shared this other Miami Vice clip, which features the late, great Dennis Farina as mob boss Al Lombard. Is it too early to start calling Michael Mann’s Miami Vice film a “classic?” Even if we’re only talking about Colin Farrell’s hair?